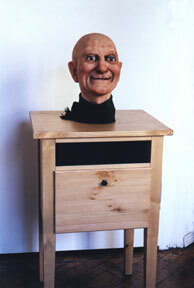 A very realistic artificial human head sits on a small table, looking into space and blinking its eyes as if it might just be conscious. The visitor may hear it say something and be surprised enough to say something back to the head. Or perhaps the visitor already has heard about this thing, and comes in ready to talk. For what is most remarkable about this head is that it is able to understand spoken English, and it is able to engage in something like conversations. It listens to what is said to it, makes some ‘sense’ of it, and responds. 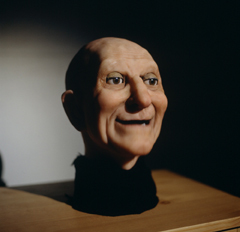 A descendant of early pseudo AI analyst programs like Eliza, personality disorder simulations like Parry, and the many severed speaking heads in science fiction films, this head has a very distinct and complex personality, with a predisposition to rhyming, alliteration, and prediction. Given certain verbal suggestions, it might begin uttering poetry, pronouncements, or get in a mood to be self reflexive. H: I am so offended. I can't tell if everyone would prod her to the left or not. H: The delicious conditions delay disturbed daredevils. V: Which daredevils are disturbed? V: Which one is bothersome? V: What is the unconscious? H: It is something that makes me feel slow with groups. V: That's interesting - why slow? H: The child will tail the things which shrink. H: Didn’t you say something about presence? V: No. Are you feeling argumentative? H: I don't have any feelings. Would you like me to be more like something else? H: The robot will case octopi. . Catch my drift? V: What is your drift? H: Where is my home? Anxious in the picture? V: How would I know? H: The hairy shipwrecks hang harmful mechanics. Would wood hood wood should should should should would. Ixnxilaltylotl. V: You make strange rhymes. H: I am so exhausted. I wish someone would turn me off now.